Enjoy this Chia Seed Pudding with Coconut Milk as a healthy breakfast packed with natural flavor. Use coconut three ways in this chia seed pudding - soaked in coconut milk, mixed with coconut yogurt and topped with toasted coconut. For this chia seed pudding recipe, I prefer to use drinking coconut milk - the kind that is sold next to the other milk alternatives. However you can also make this recipe using canned coconut milk. 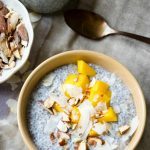 Get this recipe for Chia Seed Pudding with Coconut Milk at https://www.theworktop.com/breakfast-brunch-recipes/chia-seed-pudding-coconut-milk/.